Artificial grass has a long history of use in large scale sports applications, but is also quite popular for backyard scale sports and play areas and a wide variety of other landscaping purposes. Though it lacks the natural beauty of an actual lawn, it closely approximates the appearance of real grass and has a long list of other benefits. Artificial grass needs no mowing, watering, fertilizing, or pest management and it stays green year round. It can tolerate full sun or total shade equally well. It is also extremely durable, holding up to foot traffic, kids playing, and digging dogs much better than natural turf. On the downside, artificial grass is usually more expensive to install than natural turf, though the cost is easily recouped over time through the savings in maintenance and water costs. Of course, it is also artificial - it will never have quite the same look and feeling of a living lawn. And though it is environmentally friendly in the sense that no water, fertilizer, or gas-powered equipment is needed to maintain it, it is a synthetic product that eventually ends up in the landfill. All types of artificial turf are comprised of synthetic fibers woven on to a backing material. There are several types, each of which is more or less applicable in different contexts. Costs range from $3 per square foot of installed turf to $12 or more. 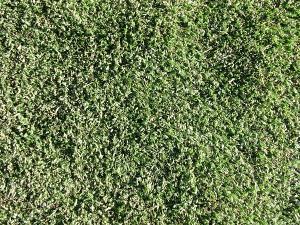 In addition to the relative price differences of the three main types of turf listed below, that are many other variables that effect price, such as the thickness of the weave, the height of the grass blades and additional materials that are used in the manufacture and installation of artificial turf products. Polypropylene is the thinnest, least durable type of turf, but is suitable for low-budget projects in areas with little foot traffic. 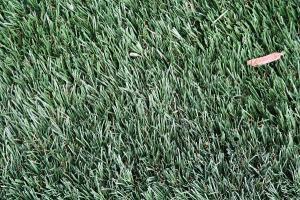 Polyethylene is the most common synthetic turf for landscaping applications. This type is known for its durability, soft texture, and realistic appearance. It is a mid-range option. Nylon is the most durable type, but it is expensive and is typically used more in commercial sporting applications than in home landscapes because it has a less realistic appearance. Warranties range from eight to 15 years, so if it's taken care of well and not abused, a 10 to 20 year lifespan could be expected depending on the quality of the grass. Check the specific type and brand you plan to buy for specific warranty information. There are several landscaping situations for which artificial turf is a popular choice. 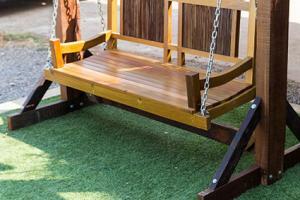 A good quality artificial turf is indestructible around kid's play areas. For these applications, it is possible to use a rubber underlayment to make a softer surface and prevent injuries. Practice your putting technique in the comfort of your backyard. 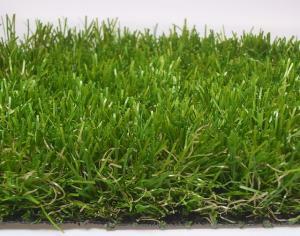 Use artificial turf with a very short blade height for this purpose. Cleaning up after pets is easy on artificial turf and the material is not stained in the process. Simply spray it down with a hose and scrub clean; look for options that incorporate microbial deodorizers on the turf blades. 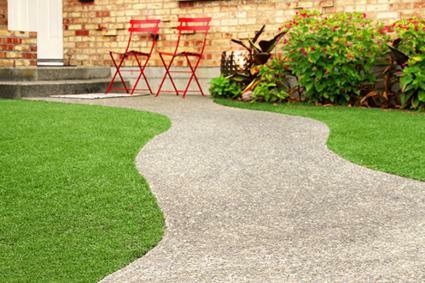 Artificial turf allows you to transform an ugly concrete or wood surface into a verdant outdoor room. This is like having an outdoor green rug -- tables, chairs, and other furniture can be used on it without causing damage, unlike natural turf. Artificial turf is a soft, cool, and green alternative to poolside decking. Pool chemicals will not stain the material unless they are accidentally spilled onto the turf grass in their full strength form. Artificial grass can substitute for a lawn in any situation, but it especially useful in areas with compacted soil and deep shade. Use artificial turf with a long blade height for this purpose so it looks more realistic - some types even have bits of tan-colored fiber to mimic the look of dead bits of grass that occur naturally in conventional lawns. Artificial turf requires much less maintenance than regular grass, but it's not entirely maintenance free. Artificial grass gets matted down when exposed to lots of foot traffic, especially the options with longer blade length. It's easy to spruce it up though - just run a plastic bristle brush through the fibers on an as needed basis to straighten them up. This is also an as-needed maintenance activity. In dry climates, periodically spray the turf down with a hose to rinse off dust, pollen and pet urine. Most spills can be cleaned up with a plastic bristle brush and a diluted solution of a mild household cleaner. Avoid using heavy-duty bleach-based cleaners, however - use diluted ammonia to clean up smelly pet messes instead. In winter, snow can be shoveled off as needed with a plastic shovel, but be sure to avoid metal shovels as these can damage the turf. There's no doubt about it, artificial turf is much easier to maintain than a real lawn. Used strategically in the landscape, its unnatural appearance will hardly be noticed and it can help deal with several common landscaping challenges.